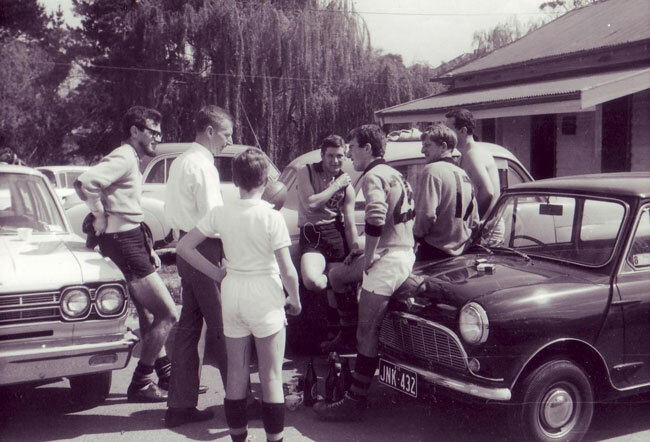 The original clubrooms: The history of St Mary’s is inextricably linked to the establishment of the Ferndale Park Sports Ground. It has been our home ground continuously since 1932. In the early 1930’s a group of young men feeling the effects of the depression years met with members of St. Mary’s Church of England Mens’ Club and advised them that they would like to form a cricket team to help them keep fit and active. 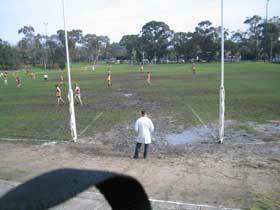 It was agreed that Camberwell Council (now Boroondara) be approached to obtain use of a ground. Council had no suitable ground readily available, but offered a marshy area between two creeks in Glen Iris Rd. for them to develop and use. A meeting was held in the St Mary’s Kindergarten Hall in Bowen St, South Camberwell on 19 December 1930 and at this meeting a Committee was formed to act as the Board of Control of the Glen Iris Rd Sports Ground as it was then known. At this meeting approval was given for St Mary’s Cricket Club to be allowed the use of the Sports Ground free of charge for 12 months. In January 1931, it was agreed that the Board should meet at the ground and view the area. Help had been sought from Peate Avenue State School for some of their surplus soil. In February 1931 arrangements were made to level and grade a playing area with different layouts being considered. At this time, a sub-committee representing the Council, St. Mary’s Men’s Club and local residents was formed to oversee the work. The sub-committee also obtained information on the required size for a football ground. The seed had already been sown that the ground be suitable for both cricket and football. In March 1931, Cr Nettleton took over as Chairman of the Committee, and arrangements were put in place for drainage and for ploughing and levelling work to get underway. The St. Mary’s Cricketers set to, with shovels, mattocks, picks and wheel barrows to prepare the area for cricket. Surplus earth from road works and the new Peate Ave State School development, was delivered by horse and dray to the site. The committee hired a horse and scoop to level the earth delivered in and of course there was the inevitable need for funding to make the hiring of equipment possible. A night at the movies was always a good way of gaining some funds and several of these nights were held. Council arranged for trees to be placed along the Glen Iris Rd. boundary and these are still in place today. It was agreed that the St Mary’s Cricket Club be charged a fee of 1 pound 1 shilling for season 1931/1932. A letter was received at the Committee Meeting of 25 November 1931 from St Mary’s Football Club for use of the ground for a fee of 1 pound 1 shilling. 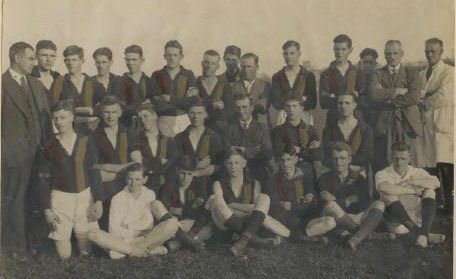 In 1932 St. Mary’s Football Club took to the field in their inaugural season, and was composed of players from the St Mary’s Cricket Club. 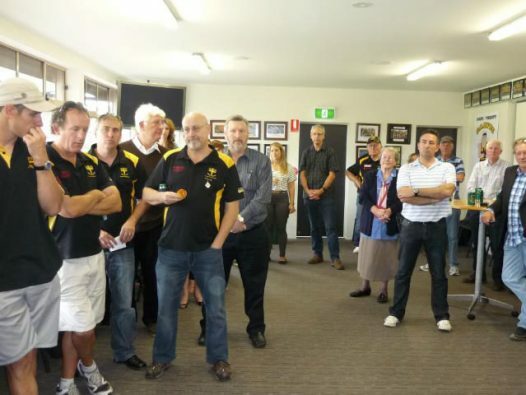 The Cricket team had affiliated with the Eastern Suburbs Protestant Churches Cricket Association and the Football Club followed by affiliation with the Easetrn Suburbs Protestant Churches Football Association which had been inaugurated in 1923. 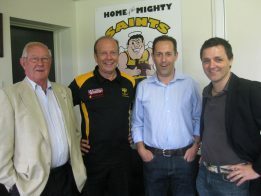 The mighty Saints pulled off their first Premiership in 1936 with Mr George Malcolm as President and William Lester as Captain. 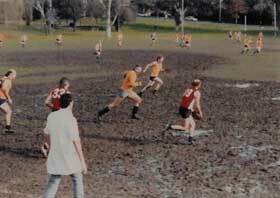 In those early years of 1931/32, the ground had no facilities and the adjoining creek and banks served as toilet facilities. After the game, a dip in the creek soothed aching muscles, although the quality of the water would have left a lot to be desired. In 1932 a request was put to Council for the installation of water and conveniences. A corrugated iron screen with trough and a charcoal pit were installed. A ladies toilet facility was requested in 1934. In 1933 the Ashburton/Glen Iris Cycle club applied successfully to the City of Camberwell to have a cycle track installed around the boundary of the oval to be used for racing and training. The cycle club brought with them a pavilion 30 feet x 15 feet which was originally situated at the Richmond Boulevard. They arranged for the transfer of the pavilion from Richmond, for their clubhouse, no doubt quite a big task in those days. Cycle races were held during tea time of the cricket, at half-time in the football and on some Sundays, on a steeply banked gravel track. A training bicycle was installed inside the pavilion mounted on a concrete base. In 1934 St Mary’s Football Club installed the first training light at Ferndale Park and probably was one of the first junior clubs to have such a luxury. 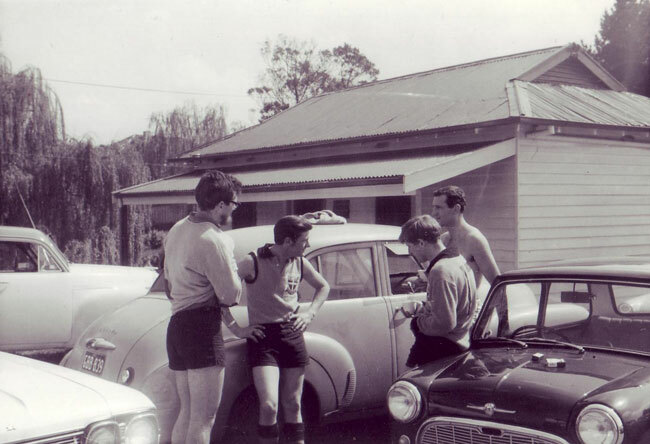 Footballers and cricketers were allowed the use of the original pavilion, and in the 1950’s/1960’s the football club made several alterations, having showers installed, a wood chip heater which was followed by a magnificent hot water service. 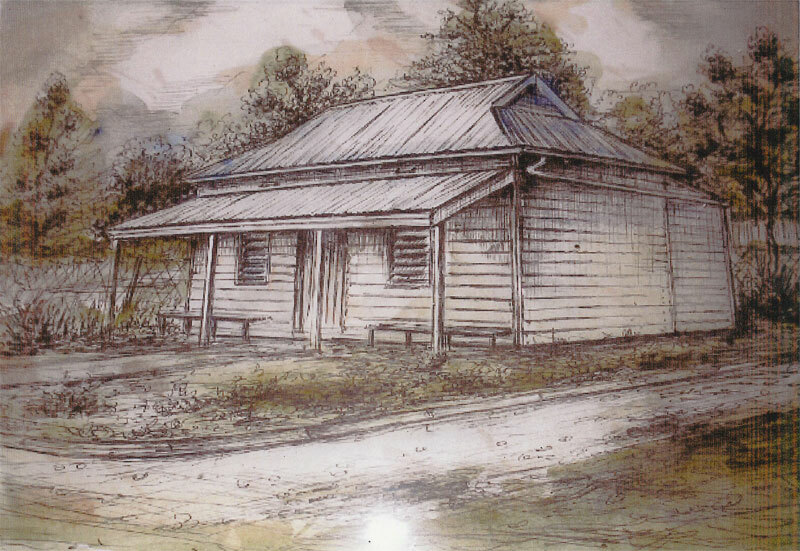 The original pavilion was demolished in 1974 after the new change rooms, toilets, showers and small kitchen were built on the hill where the current pavilion now stands. Rd 1 1976: the unfurling of the 1975 Premiership flag in front of the first brick change rooms. 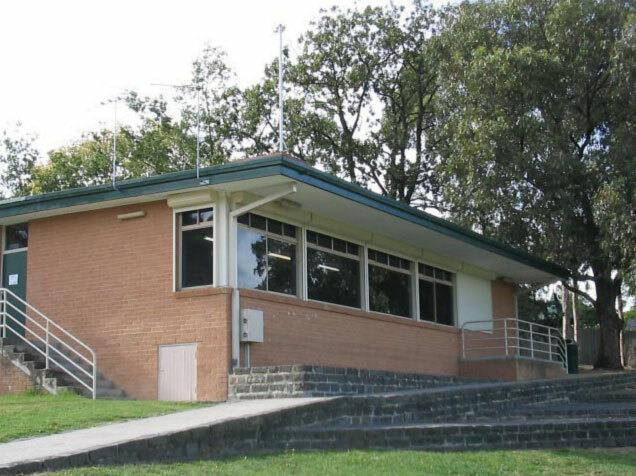 The first brick change rooms were completed in 1973, and some 17 years later in 1990, the second stage took place when the pavilion was extended to its current size. The current design with the Social room and new larger kitchen was opened in 1990 in time for our first home game in the Amateurs and the first Gold Saints luncheon. In February 1931 a sub-committee representing the Council, St. Mary’s Men’s Club and local residents was formed to oversee work at Ferndale Park. 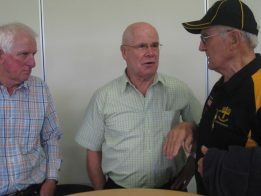 This marked the beginning of the partnership between Council and the Community to manage the park and its facilities. In 1957, Don Malcolm saw the importance of permanency of tenancy and the need for continuous improvements at Ferndale Park and took on the role of Park Secretary. 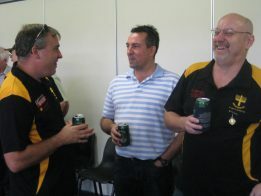 Don and Ray Leman went on to represent both the club and the community on the Ferndale Park Committee. The role of the Ferndale Park Committee was to carry out the administration of the park, make recommendations for park improvements and submit capital works requirements to Council, for new amenities in the park. The Committee maintained regular contact with the local Councillor and Council Officers to ensure good working relationships. 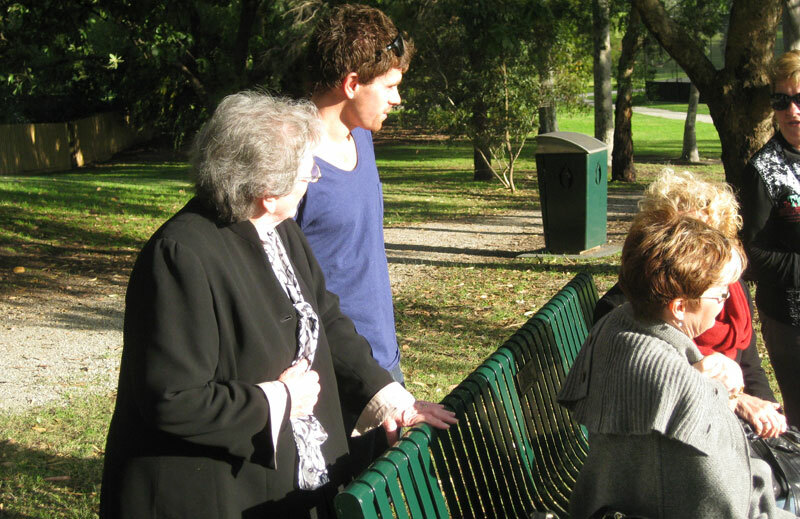 When Ray passed away in 2008, Don generously arranged with the Boroondara Council for a plaque to recognise his 38 years of service on the Ferndale Park Committee. The plaque can be viewed on one of the park seats over-looking the oval. 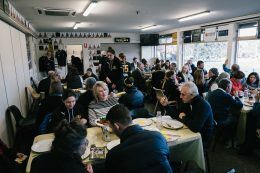 A major redevelopment of the Ferndale Park pavilion took place during season 2010 and all teams operated out of portable change rooms located in the car-park! 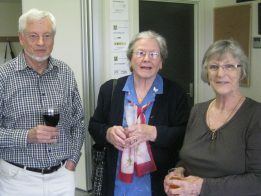 The new rooms were ready for season 2011 and were opened on Saturday April 9, 2011. 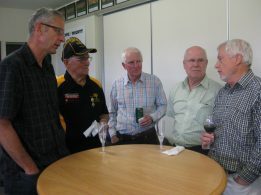 In recognition of the contribution of The Malcolm Family to the redevelopment of the Pavilion, the main social rooms was named The Malcolm Room in their honour. 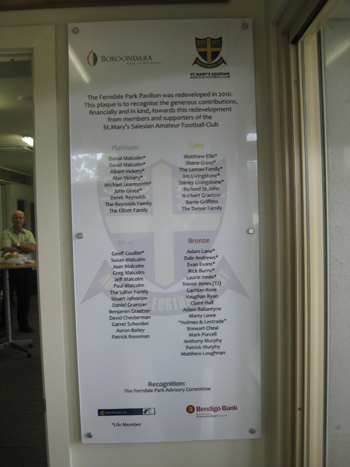 THE RECOGNITION PLAQUE recognises the generous contributions towards the redevelopment from members and supporters of the St Mary’s Salesian Amateur Football Club. 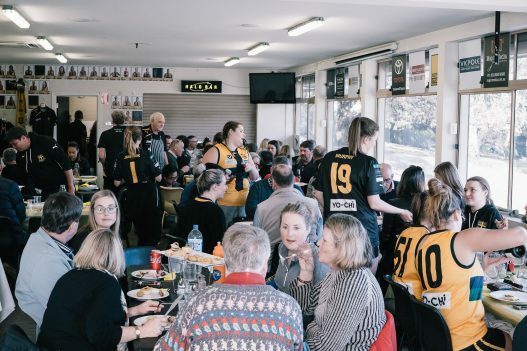 To reflect the needs of our growing club, the Committee took the decision to fund an internal renovation of the club rooms which resulted in an extension of the social room. This provided much needed extra space for our growing Gold Saints Lunches, other club lunches and the famous Thursday night meals. 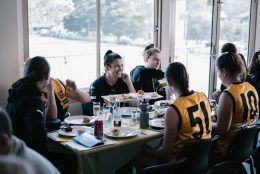 The extension was opened at the 2017 Women’s Football Lunch. Material on the Early History and the Original Pavilion was contributed by Don Malcolm from information that he could recall and also from the Ferndale Park Committee Minute Books.